Last September, Meg Duffy wrote a really nice piece about what she saw as some of the markers of a shift in career stage – like seeing a reference letter in a grad school application from one of your former undergrad students. This phenomenon is something of which I’ve been acutely aware recently, though I’m not sure why. But every few weeks, I keep finding another example, and I thought I would collate them here. Similar to Meg’s example above, last December I found myself being the external examiner for a MSc thesis that was the logical progression from my own honours thesis 15 years ago. It was neat to look back and see what I would have done differently, how someone else approached the same challenges, and how they took my rambling suggestions for “future research” and actually implemented some of them! More recently, I have become increasingly frustrated with some of the cultural systems in research in general (and academia specifically) and how difficult it’s been to change/fix, but because of how others (trainees, mentees, or other folks earlier in their career were being treated. I’ve been trying for some time to push our collective system towards a more equitable, inclusive one; my equivalent of reaching down to hold the metaphorical ladder. Or put another way, trying to be the kind of person I would have benefited earlier in my career. Some not-so-obvious markers come from increased experience, and how long we expect things to take. For example, 7 days out, I hadn’t really done much to prepare for a seminar (because it was a minor alteration of one that I had given just a few months previously), and that didn’t faze me like it would have when I was a postdoc. And the most recent example was from just yesterday. My good friend & colleague Ingrid Pollet & I, along with some other coauthors, submitted a huge 24,000-word monograph as an updated species account for the Birds of North America series. We’d been working on it since we first hatched the idea at a conference in Barcelona in September 2016, and so submitting it yesterday was a huge cause for celebration. But aside from telling colleagues, I had to make my own celebration. In grad school, or as a postdoc, for example, my supervisor/lab would have chipped in and we would have had some celebratory cake, or a trip to the pub after work. I came home and had a celebratory cinnamon bun (which was delicious). For the above, I don’t have a particular “good vs bad” take on them; they all seem largely a part of the typical progression for someone in a permanent job 8 years from my PhD. I’ll probably update this post with others as & when they manifest. Once again, NSERC (the national science and engineering funding council in Canada) has announced the winners of its prestigious prizes, which highlight the crème de la crème of Canadian science. And once again, the list of winners has an overabundance of Y chromosomes. If you’re keeping score, that’s 3 women and 13 men, or 19% women awardees. Sadly, this is an improvement (yes, you read that right) over previous years (17% in 2015, 13% in 2014, and an eye-rolling 0% in 2013). This year brings the overall total to 42 women and 252 men, or a maddeningly low total of 14% women awardees. The definition of insanity is doing the same thing over and over again, but expecting a different outcome. 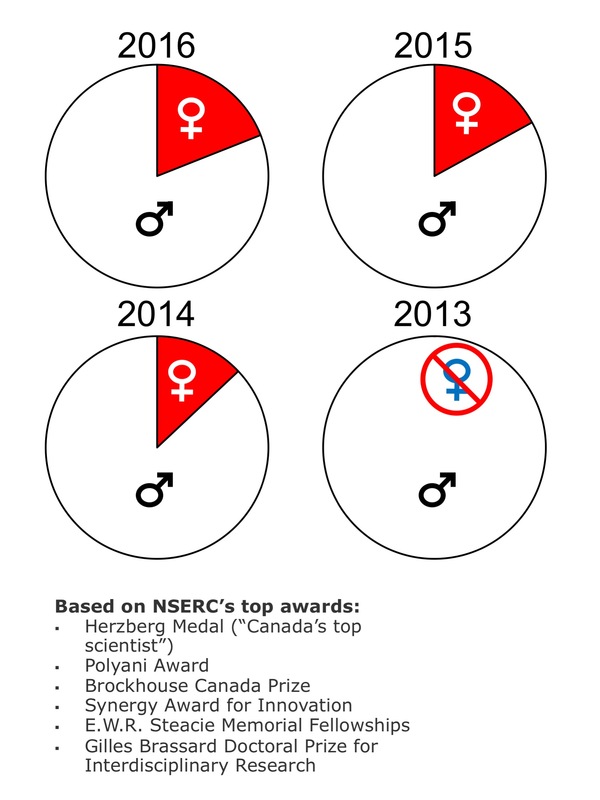 When will NSERC act to improve the gender representation of women in the highest accolades of Canadian science and engineering? Update: here’s a great graphical representation courtesy of Jeff Clements.